As the Spring Equinox arrived, the snow from the weekend had departed and left a soggy mass of football pitches around the Country. With temperatures forecast to fall to close to freezing point as we moved into the clear night, it was going to be a case of seeing what dried out, and what didn’t as we moved from the storm into the calm. My original choice of game at Belper United fell by the wayside yesterday, because the sorry tale that is currently Blaby & Whetstone Athletic, once again announced that they were unable to raise a side. I really don’t know what the future holds for that club? 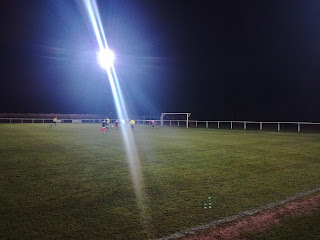 Continuing the theme of midweek matches in the East Midlands Counties League, I decided to head to a ground I’d not been to for just over ten years, the Riverside ground in Barrow Upon Soar. I’ve only been to the home of Barrow Town twice, on both occasions for local derby fixtures against near neighbours Loughborough Dynamo. 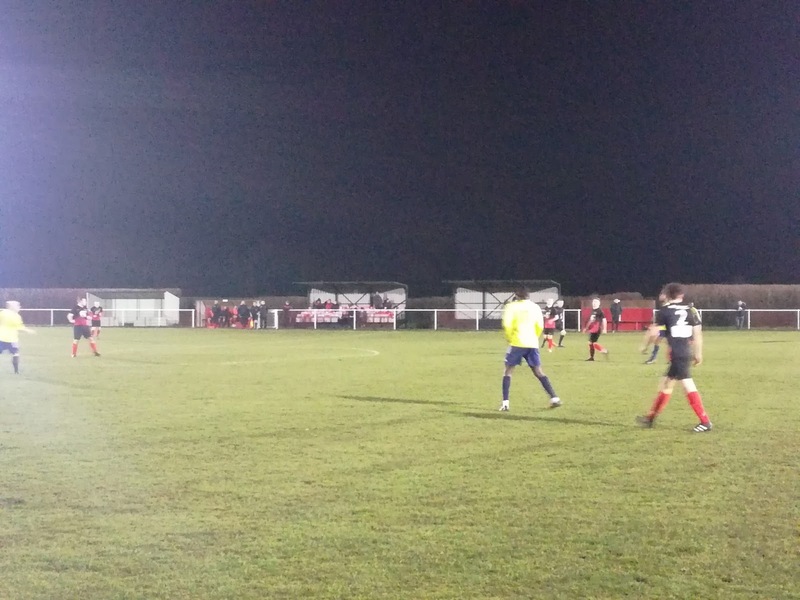 The first back in 2003 was a Leicestershire Senior League game that the visitors won 4-1 while on their way to the championship, while five years later they returned for a County Cup tie, this time proving victorious on penalty kicks. When I first went to the Riverside I was impressed. 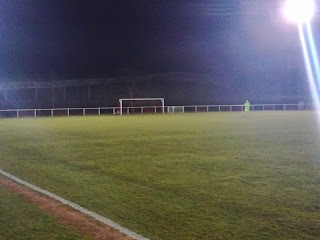 Set in a very rural location almost betwixt Barrow and Quorn, the ground is best remembered by the huge footbridge that straddles the A6, and sits behind the West goal. For those wishing to watch some free football, it’s a pretty good vantage point. Over the years the ground has been developed nicely. 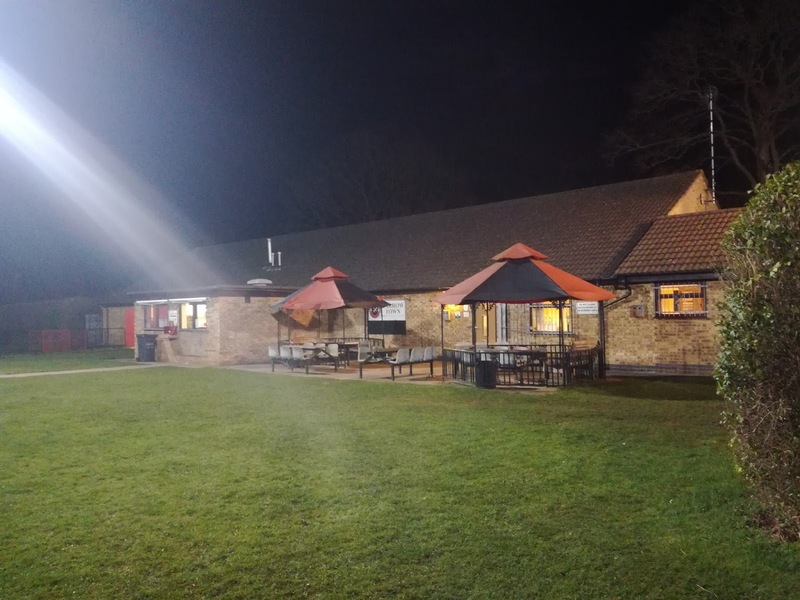 The clubhouse has had a refurb and is both smart and spacious, while the tea bar is certainly one of the better offerings in the locality. Two small stands have been erected on the far side, one seated, one for standing, whereas the ground has now been fully enclosed with hard standing. 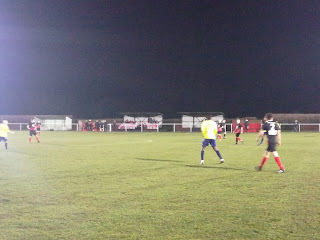 The four corner floodlights are of the more traditional variety, think railway sidings as opposed to modern day poles. They do add character to the ground. 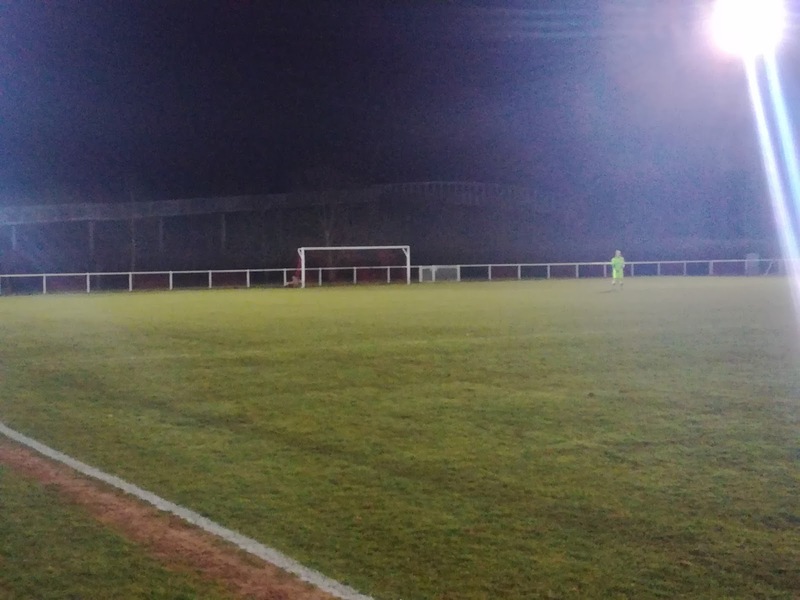 I like it, and I was also aware that the pitch is well renowned for its drainage, so when the club tweeted to say the game was on, albeit the going was a heavy, that made my mind up. The history of Barrow Town is not a complicated one. Formed as Barrow Old Boys, they became Town in 1981 before spending umpteen years in the Leicestershire Senior League. In the final three seasons of membership they finished third once and runners up twice, which meant a promotion to the newly formed East Midlands Counties League was never in any doubt. They’ve bobbed about in the EMCL, with a best place of second in 2013, only to finish bottom the year after? Not sure what happened there but I suspect a mass exodus might have had something to do with it, but I do stand to be corrected. Tonight’s visitors Arnold Town sat in the bottom three, and they in themselves is quite a story, but one for another day. Barrow sat in mid-table, and with a crowd of 34 present we waited with baited breath for what you could have been forgiven for thinking would be a straightforward home victory. In terms of support, Barrow’s average attendance is 39. In fact the EMCL is not an especially well attended league for some reason. 40-50 is the norm, with Clifton the worst supported on 27, while Selston are the only club in three figures averaging an impressive 104. Leaders Teversal average out at 68, they, like many others, deserve more. In the convivial company of Paul from Epsom, someone who I bump into a couple of times a season, we watched a very open first half finish 0-0. Arnold then took the lead early in the second period, only for Barrow to score a quick fire double to make it 2-1. The final few minutes were bizarre, Barrow absolutely tore Arnold to shreds and could have easily added four or five more goals, but a combination of the woodwork, poor finishing and excellent goalkeeping kept the ball out of the net. It wasn’t quite at freezing point at the final whistle as the cars crossed the cattle grid and out onto the A6, but with British Summetime less than a week away now, we can hopefully look forward to some drier pitches, some warmer nights and some football. The last few months have been a real killer, and when you look at some clubs fixture lists you do wonder just how they are going to cope. I’m not sure what the answer is. Investment in pitches is fine, but they can only deal with so much weather. More midweek games early season is a possibility, less cup games is also an option, as is what seems to be an FA move to reduce league sizes. Ultimately though, when you hear of clubs not having had a home game since November, and we are now almost in April, something is very, very wrong, and it’s hard to envisage in a changing climate, how it’s going to get any better. All is well under the bridge at Barrow though.